Successfully Added Smart Home Security Kit Xiaomi - Gateway, Window And Door Sensor, Smart Switch, Human Body Sensor, Smart Outlet to your Shopping Cart. 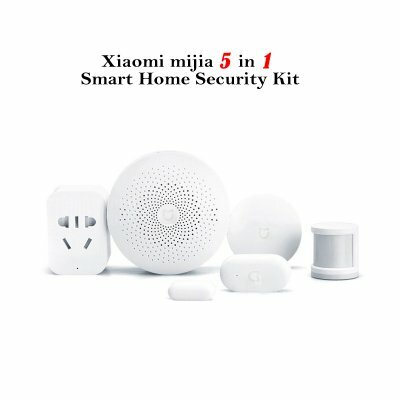 The Xiaomi Mijia 5 in 1 smart home security kit is a great kit to create the ultimate smart home environment. Coming with 6 high-end security sensors, this home security kit guarantees that never again anybody approaches your property unnoticed. Besides its security features, these sensors also offer great efficiency for everyday usage – making your life easier and more relaxed. All you have to do is sync your sensors the multifunctional gateway, connect it to your WiFi, and you’ll be all set to control your home appliances from afar via your smartphone. 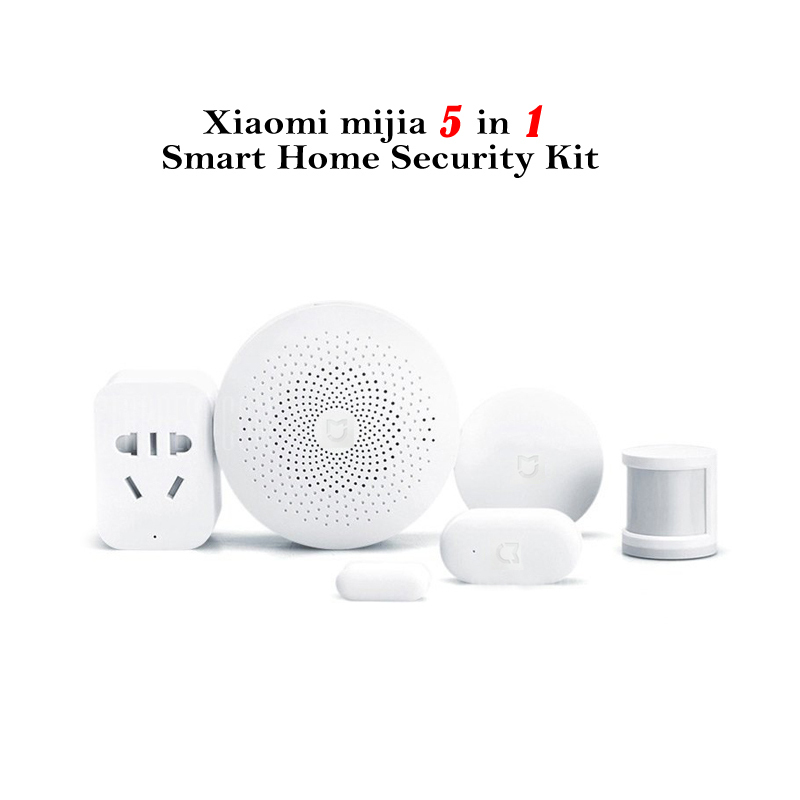 Compatible with both Android and iOS devices, the Xiaomi Mijia 5 in 1 smart home security kit works perfectly with the majority of smartphones out there. Offering ultimate home security, this smart home kit comes with an abundance of security sensors. A sophisticated door and window sensor allows you to protect your property at any time. Whenever your door or window is pushed or opened, this smart sensor will send a signal to the gateway. When connected with your alarm system, it will automatically sound the alarm in cases of emergency. Additionally, it can be synchronized with your IP cameras through the gateway, allowing it to send out signals to your cameras to start filming automatically whenever your security is breached. A human body sensor has furthermore been included in this smart home security kit. Capable of detecting human presence, this smart sensor is capable of shutting down home appliances such as the TV or air-conditioning when nobody is around. Additionally, it can be paired with your outside light or door – letting you light up the path at night or automatically open the door whenever somebody passes your property. Besides the high-end smart sensors mentioned above, the Xiaomi Mijia 5 in 1 smart home security kit also features a wireless switch to turn off all your electronic devices at once with the press of a button. Added to that, it comes with a smart outlet that can be controlled from afar via your smartphone. Capable of handling small electronics, this smart outlet allows you to safely charge devices and to shut down power supply from afar via the mobile application on your smartphone. In total, the multifunctional gateway can be connected to 30 sensors – providing you with great possibilities to turn your house or office into a great smart home environment. Arabic: - طقم الأمن المنزل الذكي - Chinese Simplified: - 智能家居安全工具包 - Czech: - Smart Home bezpečnostní sada - Danish: - Smart Home Security Kit - Dutch: - Smart Home Security Kit - French: - Kit de sécurité Smart Home - German: - Smart-Home-Security-Kit - Hebrew: - ערכת אבטחה ביתיים חכמים - Hindi: - स्मार्ट होम सुरक्षा किट - Italian: - Kit di sicurezza Smart Home - Japanese: - スマート ホーム セキュリティ キット - Korean: - 스마트 홈 보안 키트 - Malay: - Kit keselamatan rumah pintar - Norwegian Bokmål: - Smart hjem sikkerhet Kit - Romanian: - Kit de securitate Smart Home - Russian: - Умный дом безопасности Kit - Spanish: - Kit de seguridad Smart Home - Thai: - ชุดรักษาความปลอดภัยบ้านอัจฉริยะ - Turkish: - Akıllı ev güvenlik seti - Vietnamese: - Smart Home Security Kit.